The Submerged Castle (水中の城?, lit. : "Castle in the Water") is a cave located in the far corner of the Perplexing Pool. As its name implies, it is underwater, so only Blue Pikmin are capable of entering the cave. Even if the player utilizes any of a few methods of getting a non-Blue Pikmin to the cave's entrance, the game is programmed specifically to disallow it from entering the cave under any circumstances. All types of hazards are found here, though there are Bulbmin to be found as well. The Waterwraith appears on all sublevels after 5 minutes of staying in one, making it crucial that the player completes the first four very quickly, as they are unable to properly defeat the creature until the last sublevel. 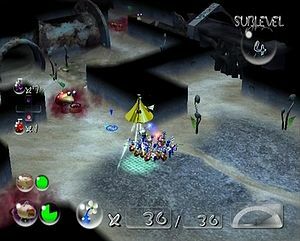 Alternately, the player can attempt to avoid or trap the rampaging monstrosity, or revisit the cave multiple times, taking a small amount of time and only a few treasures on each sublevel. There is a total of × 690 worth of treasures here in the US version of the game, and × 620 in the European version. In the river beside the Glutton's Kitchen is a black gate. 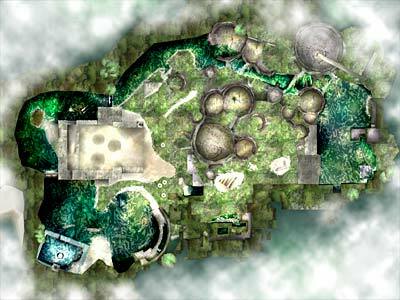 Destroying it leads to a large pool, with Hermit Crawmads, Water Dumples, and a Withering Blowhog. The cave is nearby, where the Chronos Reactor puzzle was originally located. There is little choice in Pikmin squad: only Blue Pikmin are permitted entry. Bringing 60 Blue Pikmin allows all Bulbmin to be collected, while bringing more Blue Pikmin initially makes earlier floors easier. Those not going for a no-death run might consider bringing more to serve as a death-buffer. Sadly, I am a delicate piece of machinery that is sensitive to water. You two must go alone. ...Why do you look at me with such scornful expressions? ...I am an expensive machine! It'll steam around the level on two stone rollers, which will crush and kill any Pikmin in the way, but will also kill most enemies and disable traps. Try to use this to your advantage. It will not go into small corners or spaces, so you can hide there. The best way to deal with it is to quickly snag all of the treasures and leave the sublevel before it appears. This means that you must NOT waste any time, so only focus on the treasures. Ignore enemies whenever possible and don't bother bringing back their carcasses. The Waterwraith is very, very deadly to your Pikmin, so it is vital that you stay out of its way. If you are careless, you could lose every one of your Pikmin. It follows your active leader, so watch out. However, you may be able to use this to your advantage, much like fighting the Ranging Bloyster. There is absolutely no way to harm it before sublevel 5, so don't bother trying. Move quickly and collect as many treasures as you can. Remember, if you forget to get a treasure, you can always go back and get it later. You have likely already taken note that this sublevel contains many fire hazards; keep in mind that this cave is possible to complete. To kill the Fiery Blowhog, swarm it and blow your whistle when it shakes, then swarm it again until it is defeated. Now to killing the Fiery Bulblax. You should first find the Bulblax; once you do, throw a Pikmin onto its body or punch it. Blow your whistle once the Pikmin touches the flaming body so it doesn't die but the Bulblax wakes up. Lead it into a nearby pool of water, and the second its flames are put out, use an ultra-bitter spray to keep it there. Once it dies, the Bug Bait will appear. Search for the other two treasures; the Diet Doomer is usually in the open, as is the Pastry Wheel. Look for the hole and leave. There is also a geyser on this floor, allowing you to escape after having found all treasures. However, there is little sense to doing so, as the level is usually cleared before the Waterwraith appears. This area contains Careening Dirigibugs, Fiery Dweevils and Bulbmin. To ensure safety, kill the Careening Dirigibug by throwing Pikmin at it and then swarming when it falls to the ground. For the Fiery Dweevils, ignore them unless they grab a treasure you are carrying, in which case use the leader's punches to kill it. The Fiery Dweevils are usually in an open, rusty pipe that is near the exit of a long pipe. Look around for an entrance of a pipe and walk inside (the Waterwraith cannot enter this area). Follow the pipe to a slide-like passageway, where you will go down quickly and fall out, landing near the Chocolate Cushion. Once that part of the level is complete, you can find the Bulbmin. The parent can be killed by getting close, and then throwing Pikmin onto its back. If you were to swarm it, the adult Bulbmin would most likely get a few mouthfuls of Pikmin. Once they see their leader is dead, the smaller Bulbmin will panic and begin running around; blow your whistle to gain control of them. The game decides the amount of Bulbmin at the beginning of the sublevel depending on your Pikmin amount. The Comfort Cookie will come out of the parent Bulbmin once it is defeated. Finally, the Dwarf Orange Bulborbs can be killed by just swarming them the old-fashioned way. The final treasure, the Confection Hoop can be found on a ledge guarded by some Dwarf Orange Bulborbs. To get there, walk to the opposite ledge and throw Pikmin over the gap and to the treasure. Throw more Pikmin over, since it is surrounded by the Bulborbs. The exit is sealed, so you will have to use Pikmin to smash the rock and open the cave to the next sublevel. Getting the treasure back to the Research Pod takes some effort because the Waterwraith is always coming down a small isle that you have to walk through; do your best to try to avoid it and eventualy it will go away. Get the treasure back to your ship and continue on down. This level contains electrical hazards, so take caution. Swarm the electrical wires the very second they turn off. If you have Bulbmin, let them work on it instead. The Withering Blowhog is killed the same way as always: throw Pikmin and Bulbmin on it. The Withering Blowhog holds the Activity Arouser, but the Bulbmin holds nothing. For Anode Dweevils, just throw Bulbmin on them, as Bulbmin are immune to all hazards. Defeat the Wollywog in the same way as you would a Yellow Wollywog. To end this short sublevel, take note that the last two treasures, the Succulent Mattress and the Compelling Cookie can be anywhere in the open, usually behind a gate. The Waterwraith will likely have appeared by this time, so try to ignore and break the exit, which is yet again covered in rocks. There is an Ivory Candypop Bud in one of the alcoves on this floor, but it is best ignored as the White Pikmin will have a harder time following the rest of your group throughout the next sublevel's bothersome puddles and will prove to be more of an obstacle than a helpful unit. Note: Avoid swarming the electrical wires while a treasure is about to be delivered, as you won't be able to control your leader or Pikmin. This floor is difficult due to the bomb-rocks and Volatile Dweevils that fall from the ceiling, and the Careening Digiribugs. Take careful steps here, and search for the Drone Supplies and the Proton AA. There is an Iridescent Glint Beetle running around the place. Throw a Pikmin at it to make it to drop the Pale Passion. In order to make the path safer for your Pikmin, quickly run through the area with a single leader and detonate all the bomb-rocks and Volatile Dweevils. Finish by breaking the hole and then diving on down to the final floor. As a side note, it is possible for the Waterwraith to get stuck in one of the corners of this sublevel, making collecting everything a breeze, although the creature will still follow you to the next sublevel once you go in. Here, the Waterwraith will only appear in the arena after you enter. You should have plenty of Bulbmin by this point. Start out by smashing the three gates in the starting area. Since you can't take them with you, use your Bulbmin to produce ten (more, if the strategy worked) Purples from the two Violet Candypop Buds. Now, smash the three eggs and use the nectar to give your Pikmin flowers. Then smash the final black gate that blocks access to the boss arena. Follow the strategy linked above. Once defeated, the Waterwraith will drop the Professional Noisemaker. This gives you a device called the Pluckaphone, which allows you to pluck Pikmin sprouts from the ground just by whistling at them. An earlier, unused variant of the Submerged Castle. Particularly: Add video reference to the Waterwraith being damaged in an earlier sublevel, preferably with Purples. The cavern contains 13 treasures, a famously unlucky number; this appears to be intended to reflect the cave's nature, and especially that of its boss. The music is very similar to the music that plays in the "Cave of the Past", the final dungeon in another of Nintendo's popular games, EarthBound. Both of the bosses in these caves were supernatural beings with somewhat unintelligible forms and seeming invulnerability. An earlier version of the game's English script reveals that this cave was originally intended to be called "Lookout Ruins". The Waterwraith is actually programmed to drop the Professional Noisemaker in all sublevels, not just the final one. By using external tools to somehow damage and defeat the Waterwraith in one of these sublevels, it will not appear in any following sublevel. The cave's file contains a timer for the Waterwraith to appear after 15 seconds on the final sublevel, but it remains unused in favor of having the creature spawn when the arena is entered. Curiously, the games files specify that Hole of Heroes should play on all five sublevels. Despite that, in practice, the Submerged Castle's normal theme is hard-coded to play instead. This page was last edited on February 26, 2019, at 20:44.